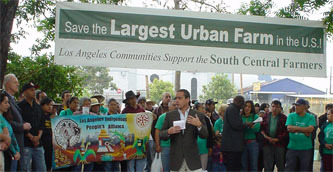 LOS ANGELES (May 18, 2006) – With the May 22nd deadline looming to save the South Central Farm from destruction, the Green Party of Los Angeles County (GPLAC) today re-affirmed its call for the City of Los Angeles to act to preserve the Farm. "We call upon the Mayor and City Council to allocate funds necessary to preserve the land for urban agriculture and community use” said GPLAC co-coordinator Mike Feinstein, a former Mayor of Santa Monica. "Doing so would not only keep the social justice promise made to the community in 1992, when it was given the land to farm after the urban uprising. But standing by now while the farm is destroyed would actually conflict with the Open Space and Conservation Element of the Los Angeles General Plan," he said. The introduction to the Open Space and Conservation Element states that " economic, social, and ecological imperatives require that Los Angeles take full advantage of all existing open space elements in the City." It goes on (under Objective 6.4 “Community Stability”) to specifically name South Central Los Angeles as an area in need of more parks and open space -- especially spaces that “contribute positively to the stability and identity of the communities and neighborhoods in which they are located” -- and references how such spaces can establish "economic stability" and “pride of place” in neighborhoods, all of which has already been achieved at the South Central Farm. The downtown 14-acre plot – located at Alameda and 41st St. – has been sustaining 360 families by providing healthy fruits, vegetables and medicinal plants supplementing their household budgets since 1994. "Allowing this living example of ecological sustainability and community self-reliance to be destroyed now would be ‘penny wise and pound foolish’”, added Feinstein. The GPLAC has made the effort to save the Farm a major priority for the last six months and will be participating in the "Save the Farm" demonstration this Friday (May 19) at 9 a.m. at Pico and Figueroa, before going into Los Angeles City Hall to speak to the City Council during public comment.